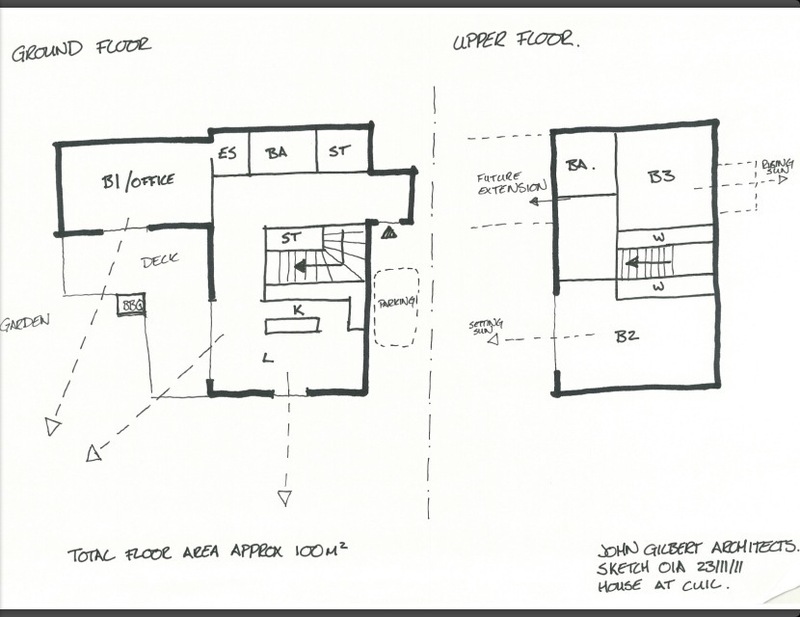 This is the sketch that accompanied the tender document from the architects in November 2011. The story of the design for the House at Cuil started with a little sketch that Matt, the architect, drew as part of the tender document for the job. It had a main roof-line north-south, harled, and a wood-clad gable extending west, making it an L-shape. There was a deck in the enclosed corner facing south and west. 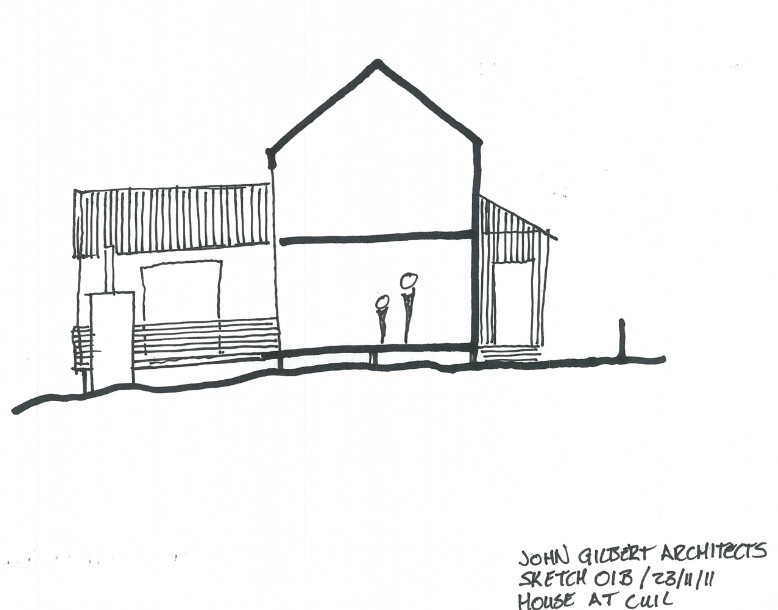 I liked this sketch when I saw it and, in fact, it was one of the reasons that I chose John Gilbert Architects, and specifically Matt Bridgestock, to do the job. However, until recently, I hadn’t thought much about that little sketch. It’s been a long time since Autumn 2011 when we finally bought the plot and engaged the architect, and between then and now, the house has been through an eclectic assortment of different styles, none bearing much of a resemblance to that original idea in outward appearance. 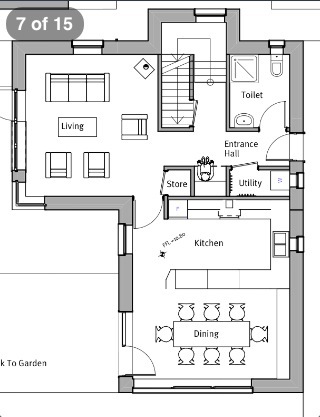 This may have been because the spec had changed at that point to a four bedroom house and so needed a different approach (we are now back to three bedrooms due to needing to keep a lid on costs) but I’m not entirely sure. Despite my initial enthusiasm for the simple sketch’s design, I had forgotten all about it until we had a meeting with our planning officer to try and get the planning permission sorted for the house. As the discussions with the planing officer progressed and we agreed changes to the design, Matt noticed that we were heading full-circle. We were heading back towards the design, that we had sent to planners in the pre-application and, frustratingly, we had altered at their suggestion. But it bore an even more striking resemblance to that original sketch. Both have a similar shape, orientation and materials for cladding. Even the interior is similar, except for the position of the stairs. After all the grand plans and changes and tweaks and headaches, we’ve come full-circle. Which leads me to ask why it has taken such a long journey to end up so close to where we started. with the refined gold. I think that this long process of designing the house has been useful, necessary even. The journey itself has added immeasurably to the final design. I loved that original sketch and I love the final design even more. I am glad that, somehow, we found our way back there. The past few months have been busy in the other 99.9% of my life with a new job, the organisation of various community activities and general family busy-ness so it has been a good time to have a wee break. Now I hope I can make a little mental space during the summer to reanimate the project after its long hibernation. I’m not sure what took the planning process so long. We were told that it would be eight weeks but it turned out to take more than eight months. That seems like a very long time to me but, no one I’ve spoken to about it seems surprised at the lengthy gestation. In the lead up to planning in September, I wrote a letter to all the residents of Cuil Bay explaining our hopes for the project and introducing ourselves to the ones that didn’t already know us. Delivering the notes by hand gave a great opportunity for meeting people and I drank many cups of tea that morning doing the rounds of the little community. This initial letter had the first thoughts on what the house might look like and we invited comments and feedback. We also had submitted a pre-application consultation, a process almost as formal as the full planning, to get comments to help us with the final design. We combined all this, with comments from neighbours and my own thoughts, and came up with a rethink on the appearance of the house and in October, before we submitted planning I sent another note round to the community with an update. We expected a swift response from planning after we were assured that there was an 8 week turn around for applications, not including any time they sent things back to us for work. Things went rather quiet after that, for quite a long time. In January Matt and I set off for what turned out to be quite a road trip to visit the planning offices in Fort William. The weather was absolutely foul, with rain already turning to snow as we left Glasgow. The forecast was for worse and, as we crawled along the A82 in the settling snow, I began to doubt that I would make back in time to pick up the kids from after school club. There would certainly be no detour to the plot for a site visit. We stopped at Tyndrum for coffee at around 11am, already about an hour and a half later than we expected and found, to our bitter disappointment, the wonderful Real Food Cafe closed. The discussion hinged around whether to go on over Rannoch moor and risk not being able to return if the snow continued, or whether we should postpone and return, beaten, to Glasgow. In the end it was the motivation to sort out planning that overcame the worries and we set our faces to the driving snow and pushed onward. The driving conditions improved markedly past Tyndrum and we arrived in Fort William only 2 hours late for the meeting. The aim of the trip was to establish our planning officer’s general feeling about the plans and what, if anything, we needed to change. Matt talked us through the theory and philosophy around the design for the house, expanding somewhat on the arc-waffle contained within the design statement. He appeared to be doing a passable impression of the Jedi mind trick and the planning officer nodded in agreement through an intoxicating wave of architectural technicalities. 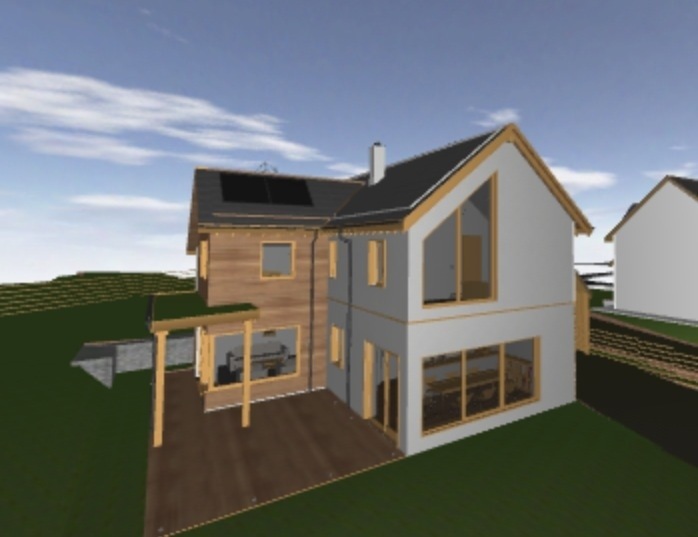 The officer was very happy with the design: it was well suited to the area, it was sympathetic to the vernacular while demonstrating good sustainable design principles and it was great we’d already had contact with the neighbours about our plans. 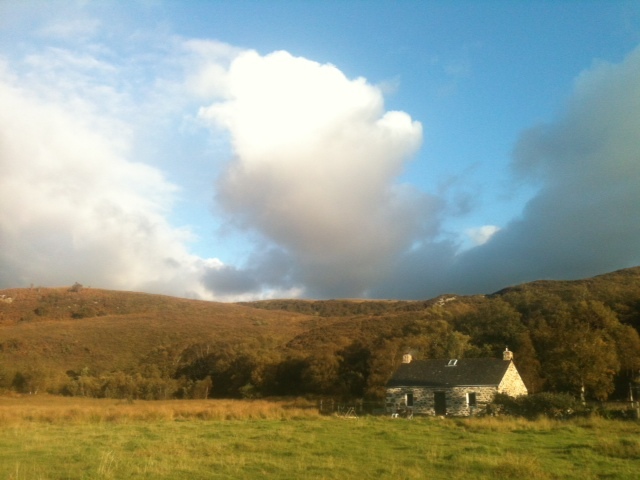 But then the spell started to waver: the neighbouring plot had planning permission for a modern version of the Highland two-up two-down and our house needed to reflect that design. Matt wasn’t put off his stride, he extended his argument to the, as yet unbuilt, house next door. Our house could be considered a steading to the house next door, our ridge height would be lower than the house next door, the wood of their planned garage reflected the wood construction of our house. 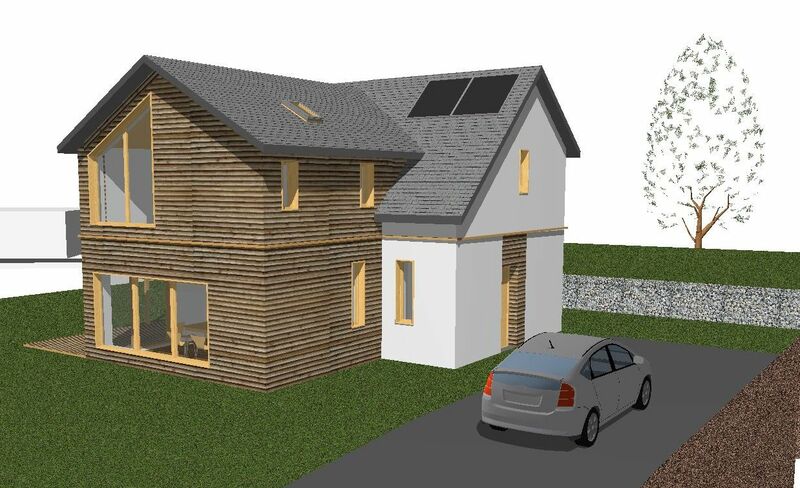 After a bit of really useful and productive discussion we came up with a happy way forward – we would switch from a T shape (main roof line east-west to an L shape (main roof line north-south) and harl the main north-south section and wood-clad the other gable (rather than wood cladding the major part). This change required some minor fiddling and actually resulted in a more satisfactory interior layout with space in the centre of the house for a masonry stove. Both the architects and myself feel that we now have a better house after the discussions. Within a week Matt had the revised plans back with the planner and then things went silent again. By March the architects were regularly emailing and calling the planners to check on progress. I felt like I was waiting for a bus that would never come. Perhaps someone had set up a diversion that I didn’t know about. Then, all of a sudden on 9th May the status of the application on the council website changed. We had planning permission. We are actually going to build a house.